I was away in Boston for 24 days for work. We were very busy working 10 - 12 hour days M-F, 8 hrs on Sat and one Sunday a few of us had to work 4 hours! A new team took over Thursday and my team arrived home on Friday. I was so tired at the end of the days I did not get any stitching done! I was working on an EGA Group Correspondence Course (GCC) - Assisi by Marion Scoular. The deadline for submission was July 21, but when I explained to her my situation she graciously gave me an extension, and permission to post my progress on my blog. So here goes. The course involves making three small pin cushions with thimble designs. I am doing them all on 28 count off white evenweave fabric and DMC floss - all from stash. The design size of each of the three pin cushions are 1.5" wide by 2.25" tall. Each thimble is stitched a bit different and the last design is a larger one we design, or we can use the one she provides. Here is the first thimble. 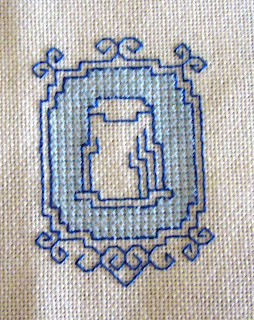 First I stitched the thimble outline in dark blue, then the other outlines. All outlines all done using running stitch. The last step was the light blue cross stitches. Assisi embroidery involves the background being stitched and the design motif is not stitched, but outlined. I was not aware of the outlined part until I took this course. It has been fun so far and I learned a cool tip to help keep the running stitch lines straight. You use a sharp needle and when you stitch the return trip of the running stitch you pierce the threads from trip one. Marion explains it better and has pictures that help too, but maybe if you give it a try (or better yet take the course) it will make sense. If you are an EGA member, you really should consider taking this course. There is lots of other good information, and I have taken GCCs from Marion before and she is very helpful and nice with her critique of your work. The critique part is optional, but I like to get input so I try and get it done in time. Which is why I really appreciate the extension she gave me. The second thimble will be similar to the one above, but the thimble will have some diagonals in it to give it smoother edges. I am doing it in purples. 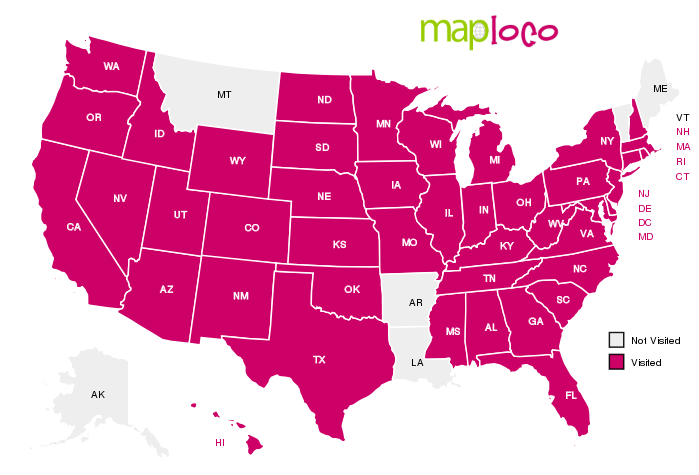 I also plan to do the inner outline in the lighter purple. 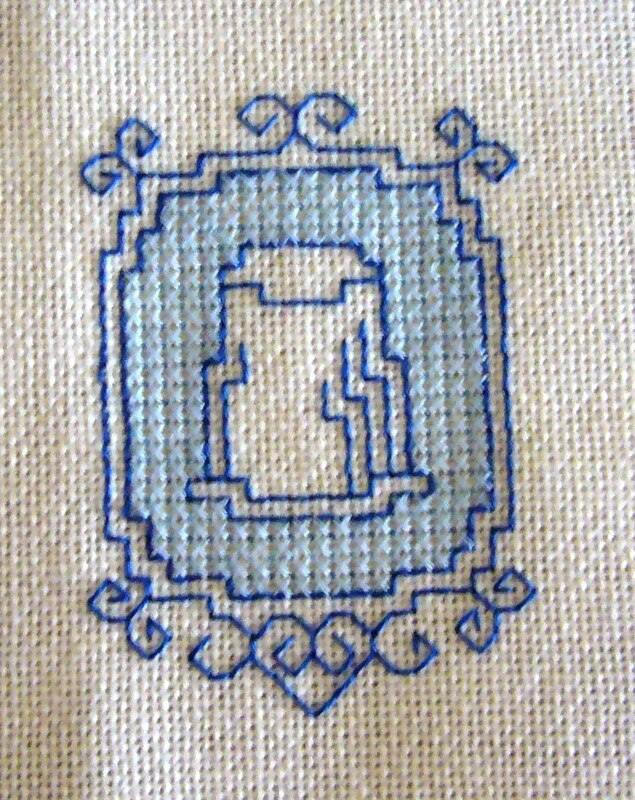 The third thimble is outlined like the first, but the background stitches are N stitches, not cross stitches and so only the most outer outline will need to be stitched. Right now I plan to do those in greens. Depending on how much time I have to get it done, I will either try my hand at a design our use the one Marion provided. I have until mid September and I think I can get it done by then! 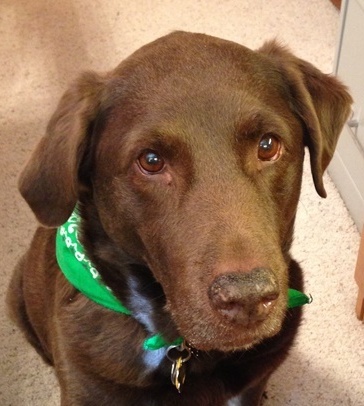 Have you heard of Zibbet?